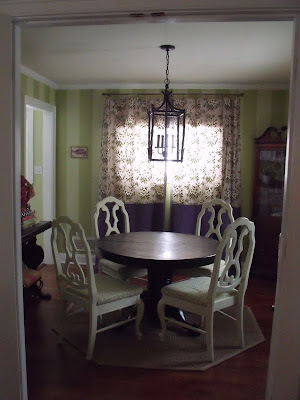 Do we remember my dining room lantern that I purchased last month? Well, it arrived about a week after I purchased it and I convinced Carter to install it that evening...so it's been up in our dining room for almost a month and I love it! But, the only pictures I was able to take of it have been night pictures, which are not so good. I finally had my chance to take a good daytime picture yesterday because I've been working from home due to the EXTREME snow we've had here in the DC area. Sorry...the pictures were a bit hard to take to show her well...and the snow glare made the windows SO bright, but you get the idea. I'm still debating if I should hang it one notch lower, but I'm afraid the bottom edge would be in Carter's line of sight when he sits at the table (he's 6' 3"). For now, I'm looking for a large ginger jar or vase to put in the center of the table to fill up some of the vertical space. Oh, and my plan DID work! Once Carter saw it up, he liked it and all was well at the AO House. Not to say there wasn't a bit of grumbling and lecturing about the chandy we had already purchased, etc., etc....but once it was up we were all good. p.s. 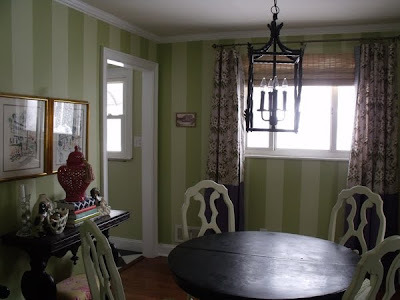 Did you catch how Averill over at Odi et Amo used this lantern? I think you'll like it. It looks fantastic! And I think the scale is perfect for the room and your table. 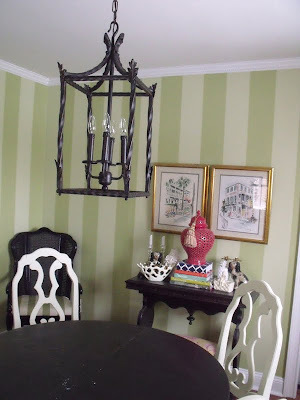 I also love the white dining chairs -- where did you score those? I think the lantern looks great. I ordered my chandy in October and it arrived last week, only to have to go back b/c the color was wrong...so frustrating. Thanks Susie! Bummer about your chandy :( But I'm sure when the right comes back you'll be so happy to put it up! 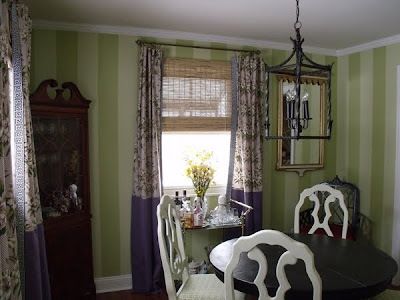 When you were meticulously drawing lines on your walls to make those stripes, did you ever, EVER think it would look so put-together and beautiful?? I love the room and am glad Carter recognized how incredibly right you were (as always) to purchase it. Snow, snow, go away. Oh Jo, you are too kind! It looks great!!! The chandelier should probably be hung 30 inches off the top of the table. If you would like some snow humor today, stop by for a visit! Gorgeous! The fixture somehow transforms the room. It looks complete. After seeing the new chairs, I had to snoop to see the rest of your dining room. It is lovely! I love, love your style. I love the lantern! I just got one from Ballard that is not right and I think this one is perfect. I keep clicking on the link however, and I just get the TV stands website and can't find the lantern. Am I looking in the wronge place? Help! Thanks!! I am unhappy to report that I can't find it being sold online anymore - I think it was made by a company called "Living Well"...if I come across again, I will let you know!